Image by S. M. Mobasser Hussain. 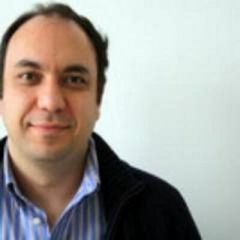 The World Cup Goal-E. Used with permission. 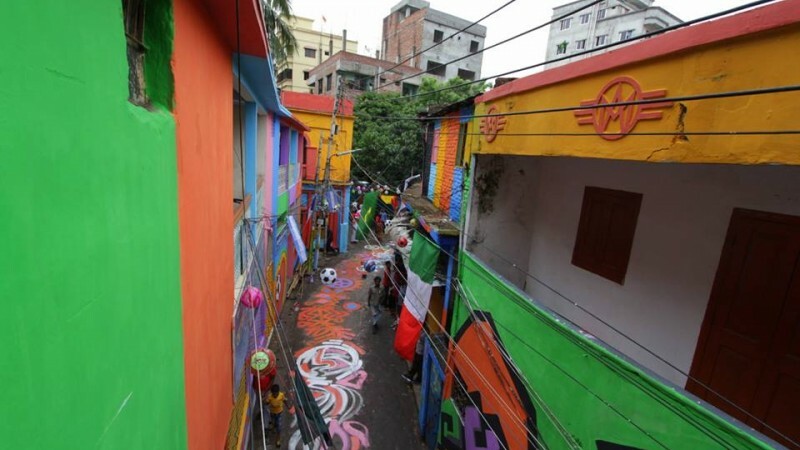 What was before an ordinary lane in the Bangladeshi capital's historic neighborhood Old Dhaka is now a vibrant strip of street art celebrating the 2014 FIFA World Cup. 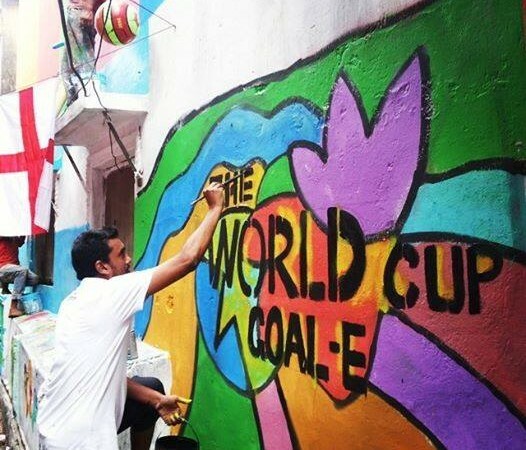 A group of about 200 volunteers transformed the street in less than 24 hours as part of The World Cup Goal-E, a collaboration by youth organization One Degree Initiative and advertising agency Zanala Bangladesh, to spread enthusiasm for the World Cup. Goal-E sounds like goli (lane), which is a common feature in Old Dhaka. Bangladesh didn't qualify to play in the 2014 tournament, but the country's football fans have caught World Cup fever nonetheless. Many are cheering for either Argentina or Brazil. Flashmob at KoltaBazar. 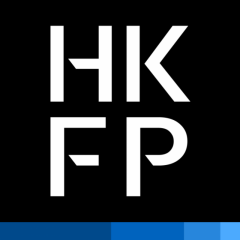 Image by Dipu Malakar. The World Cup Goal-E. Used with permission. Image by Sabhanaz Rashid Diya. The World Cup Goal-E. Used with permission. 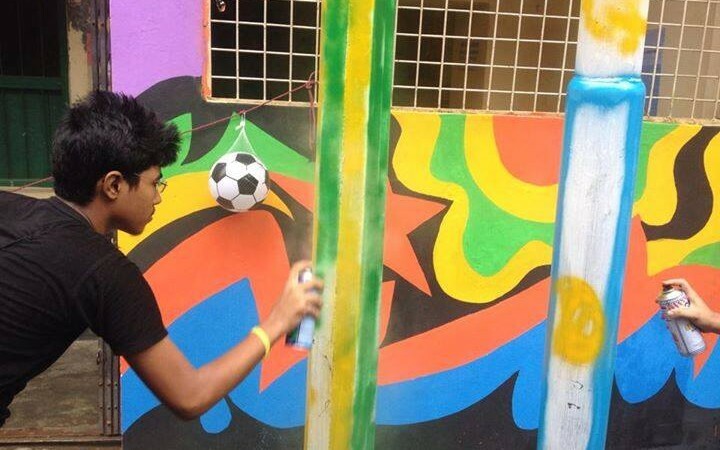 Global Voices (GV): What inspired World Cup Goal-E? 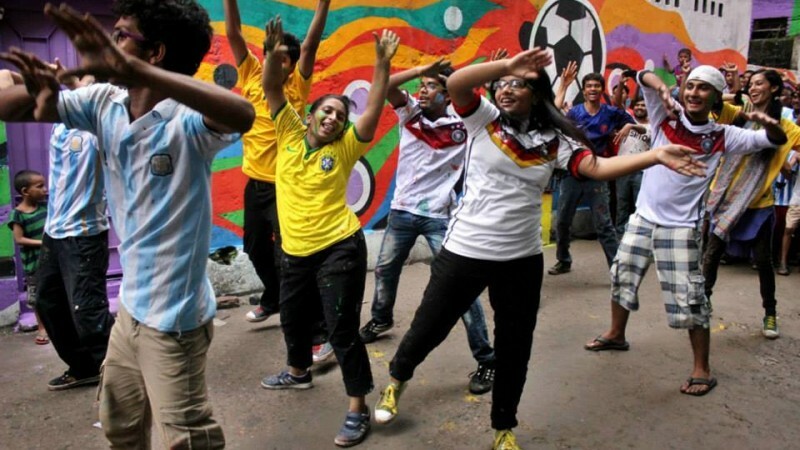 Sabhanaz Rashid Diya (SRD): The whole world is celebrating football World Cup in many ways. We've grown up seeing flags of Brazil and Argentina at rooftops during the World Cups, we've heard of brawls and fights over who's a more deserving champion. But why not do something different? 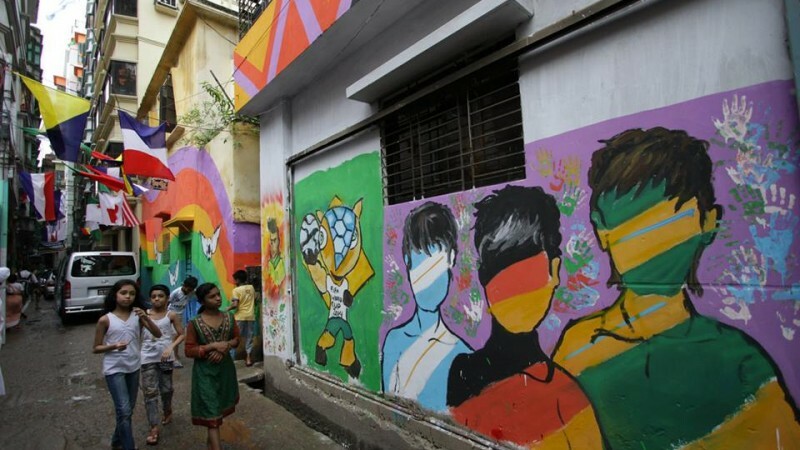 The beautiful graffiti in many parts of the world inspired us to paint a lane in old Dhaka. We also wanted this street to be a tourist destination, a new way of identifying with Dhaka. As one of the fastest growing metropolitan cities in the world, it had enough potential to become a tourist spot as well. We are lauded as some of the happiest, most hospitable people in the world, so why not make our streets as welcoming, as exotic as well? 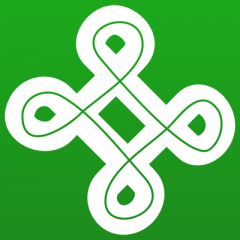 We want to recreate the concept of tourism and make people realise it isn't limited to natural havens, but can also be discovered and created by the common people. World Cup Goal-E stands proudly as an example of that. GV: Why was this particular Old Dhaka goli chosen? 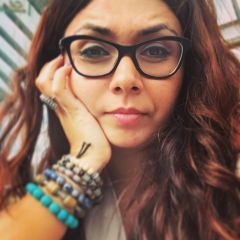 SRD: We chose the goli in Old Dhaka because it resonates the social culture common to South Asian countries. Everyone knows everyone, the younger populations, inspite of having their own independent families, still greet the elders with lowered heads, and children grow up as everyone's kids in the community. When we were pitching the idea, the community at Kolta Bazar embraced it the most and participated very enthusiastically. 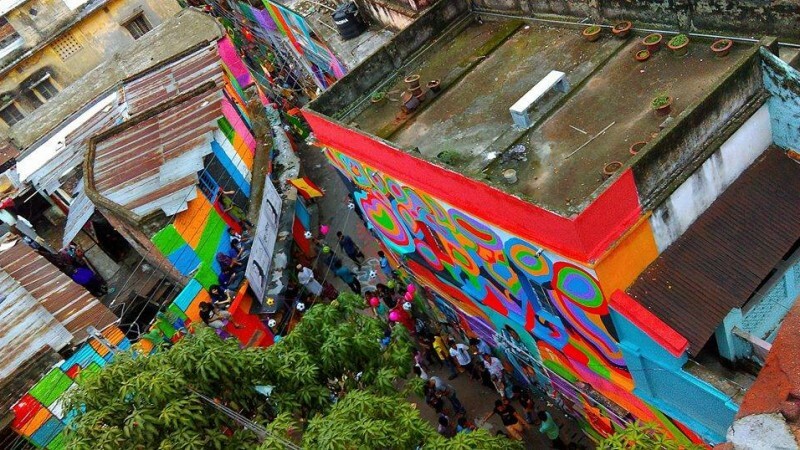 The streets of Old Dhaka also have architectural value, so it only made more sense to do it there, given the World Cup Goal-E is also somewhat an art and design initiative as well. 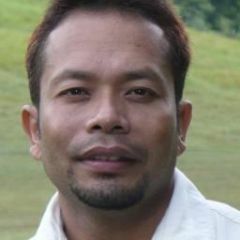 GV: How can this celebration of football be replicated on other lesser known golis in Bangladesh? SRD: Anyone, anywhere can recreate this. 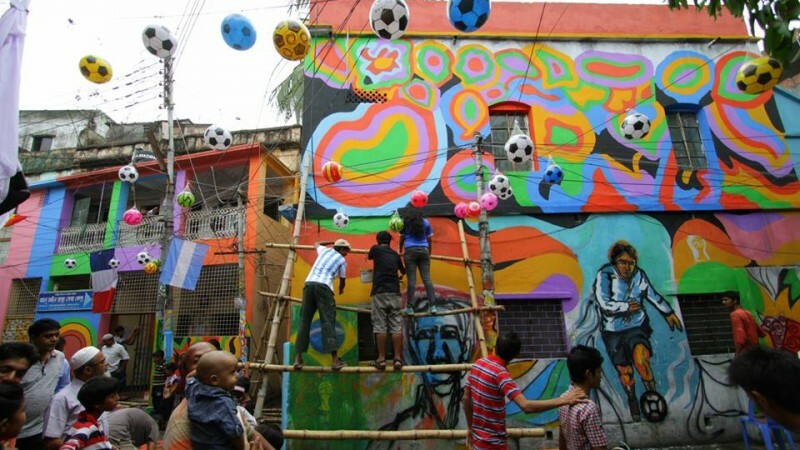 There are neighbourhoods and local markets (bazaar) in rural Bangladesh that proudly repaint their stores and houses to represent the football team they support. 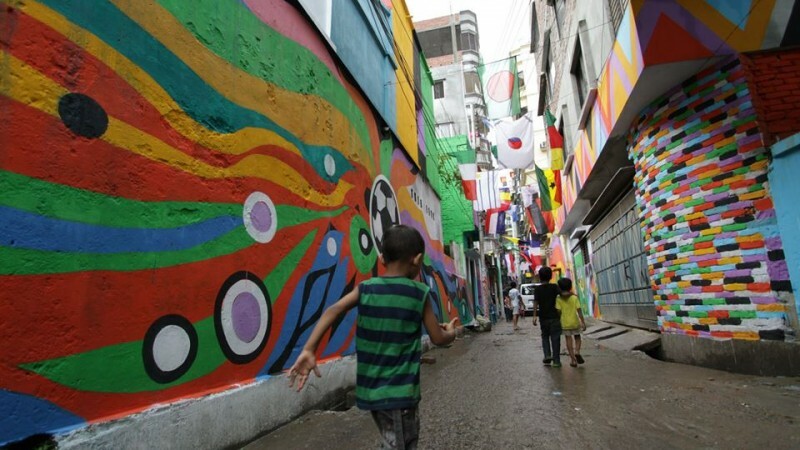 So, if you were to ask me of a particular street, I'd say every street in Bangladesh is somewhat a smaller, yet equally integral and inspiring part of what happened at World Cup Goal-E. In fact, this particular Goal-E is inspired by the millions of football lovers in Bangladesh who go to great extents to show their passion. Please do share the video so even if WE can't paint everything, someone else is inspired enough to do it themselves. Image by Md. Mostafizur Rahman. The World Cup Goal-E. Used with permission.